In your training sessions, you have a choice about what type of training you do. You could do regular training drills, where you know where the ball is going. You could do irregular training drills, where you don’t know where the ball is going. Or you could just play matches. Whilst all three training methods are very useful in different ways, in this blog post I’m going to make the case for playing more matches, especially for players who have reached a more advanced level. Regular drills (where you know where the ball is going) are really useful for developing technique. They are essential for beginners and intermediate players who are learning how to play. Regular drills are also important for advanced players to maintain the quality of their technique and develop their technique further. So there is no doubting the importance of regular drills. But spending too much time doing regular drills, at the expense of other training methods, can be counter-productive. I’m sure you know the sort player. He/she looks amazing in the training hall, hitting beautiful backhands and forehands. But all these players ever seem to do are the same routines. Forehand to forehand or backhand to backhand or maybe a little sequence of switching between forehand and backhand. These players often have excellent looking technique, but when it comes to playing matches, they struggle. By heavily focusing on regular drills, these players are learning the mechanics of the shots they are playing, but there are many things they are not learning which are vital for match-play. Essentially, they are learning a dance routine. Move feet here. Rotate there. Contact ball now. Move feet here. Hit ball there. Etc, etc, etc. Whilst this set routine can look really good, it’s not really table tennis. 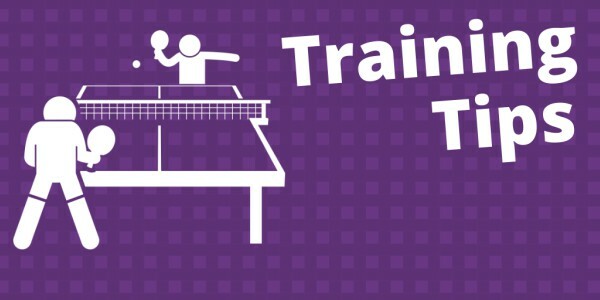 These are all the things you need to master to actually win table tennis matches. This is why (at amateur level), you can get a player who looks quite average and unorthodox – who can barely keep a rally going in a warm-up – but can still easily beat a player with seemingly far superior technique. The ugly looking player may not have great looking strokes, but by doing lots and lots of training matches, he has learnt how to use his strokes tactically, how to serve effectively, how to return serves, how to deal with the randomness of match-play and how to win matches. Some players avoid playing matches in training sessions. Some find it too confrontational. Others want to protect their ego. They don’t want to risk losing in fear of moving down some imaginary pecking order. But by never playing matches, they never really learn to play table tennis. The key to playing matches in training sessions is not to worry about winning or losing. Who cares if you lose? It’s only training. Instead, approach each match as a learning opportunity. This could be trying to serve in a certain way, return in a certain way, trying to topspin rather than push, trying to move your feet better or whatever the priority is for you. It’s an opportunity to experiment, try out new tactics or use new shots you have been developing in your regular training drills. I often train with a player called Martin Gray, who has been ranked top 50 country in the country. We have a short warm-up and then play lots of matches. Martin beats me every single time we play, but sometimes I get close. I find these training matches really, really useful. I get to play with a high quality opponent. I learn from my many errors. I learn to play more positively (I have to otherwise he destroys me). I learn new tactics. I learn how to serve with more spin. I learn how to take risks. I learn how to play table tennis at a higher level. It keeps me sharp and makes me a better player overall. I’m not saying you should never do regular training drills. Of course you should. Regular drills are so important when developing, maintaining and improving your technique. But you also need to spend time applying your technique when the play is more random. After all, this is what table tennis really is. This could be irregular training drills, where you don’t know where the ball is going to be played. Or it could be lots of match-play. Most amateur players only have a limited time to train. This is typically one or two hours a week, although some are able to train a bit more. Don’t waste this time doing endless forehand to forehand or backhand to backhand rallies. This may sound a silly question but when playing practice matches with a much stronger player like your friend/team mate do you find they give you a chance or maybe play at a certain level to have fun or rally a bit?. I don’t mean lob the ball high but I do mean get the ball back without finishing the ball off quickly. The reason I ask is it’s really hard to get good practice in general like that or have someone spend time who’s lots better. Most of the better players either won’t practice with us older and lower players or when they do it’s very hard not to get destroyed because of the level difference and its a bit like 2,2,3 shake hands and they go back to playing together again. It really feels a bit like a different game than I play. We did have one guy come down once or twice a while back who was very good not sure how good because he just played with everyone which was a breath of fresh air. He seemed to have a smile on his face whatever player he was playing and seemed to be able to drop down or up gears to play with every level at our little club. I suppose it’s just luck to find someone to train matches with sometimes. Maybe we could borrow your Friend/teammate! Keep up the great work Tom enjoy reading your posts. When I play with Martin, I always get the feeling he has an extra couple of gears he could go up if he needs to. But I like to think that I can give him a good match, so he can’t drop his level too much. I think the ideal is to play practice matches with players who are in your range (a bit worse, the same, or a bit better). It the gap is level is too large, then it’s not so useful. Although you can always make it into a handicap match, to make it fairer. Or if you are the stronger player, you can focus on using (and developing) your weaker shots and this also evens things up a little.